It’s no surprise that new LA mayor Eric Garcetti is a huge fan of music events happening in Los Angeles. Last summer Garcetti approved Jay-Z’s curated ‘Made in America’ tour in Downtown Los Angeles which featured a plethora of artists including Imagine Dragons, Kanye West, Gareth Emery, Afrojack and more. For many years Los Angeles has shied away from approving large-scale music events (especially dance music ones) within the city limits. A lot of this has had to do politics surrounding the death of a underage teenager at the last EDC Los Angeles in 2010 held at the Los Angeles Memorial Coliseum. However, the recent announcement of a Steve Aoki show in Downtown Los Angeles shows the new Mayor appears to be representing a possible shift in the city’s openness to hold dance music events. 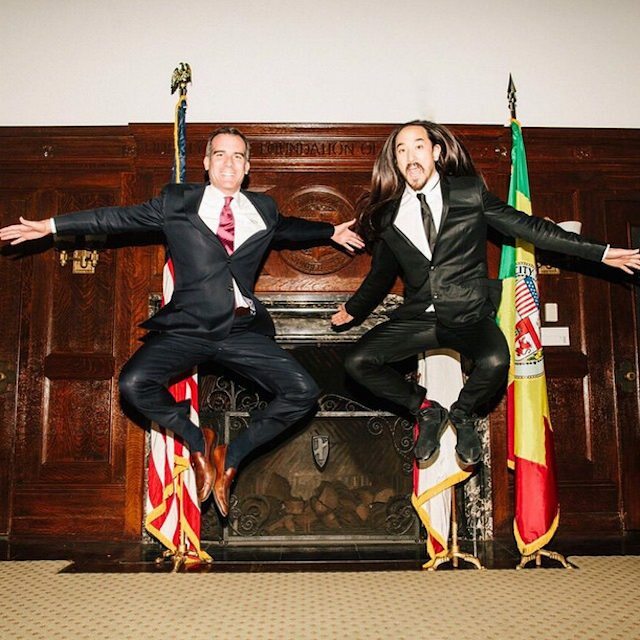 Yesterday Steve Aoki, along with Mayor Eric Garcetti announced a free Steve Aoki show in LA on May 16th dubbed “LAoki.” The free event follows and will promote the new Steve Aoki Neon Future II album release on May 12. According to Billboard, the show will go down 6 p.m. to 11 p.m. on Broadway between 4th and 6th streets, and will be all ages. No word yet on capacity, but it’s estimated that nearly 5-10,000 free tickets will be available, as well as VIP tickets for $100. You can check for any available tickets here (more may be released soon), once you sign up for Garcetti’s Volunteer Program. It should be a fun event and obviously we’re interested in seeing the future of dance music events returning to Los Angeles. Last summer’s Made in America festival generated nearly $15 MM for the city. Maybe LA is finally getting the hint.